Ever since my daughter was a toddler, she has been interested in cooking. Now that she is seven-years-old, I decided it was time for her to give it a go in the kitchen with her own cookbook. 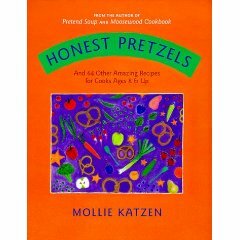 My daughter’s source of inspiration: Honest Pretzels, a cookbook for children written by Mollie Katzen of Moosewood fame. My daughter hungrily reads the recipes in Honest Pretzels, which are laid out in an illustrated, very kid (and adult) friendly way, including a section “Ask an adult for help with”. She wanted to make something immediately, but neither her father or I had the time to help her, so we let her go at it on her own. It was her first solo cooking adventure (except for using the oven), and she did well. At one point, she asked me whether she should pour the flour from the five pound bag into the measuring cup or dip the cup in the flour. Thankfully she asked and a huge mess was avoided. The organic Button Cupcakes were delicious. I’ve modified Mollie’s recipe below, such as omitting the Hershey’s Kiss on top (not supporting Hershey) and only using organic ingredients. I’ve written it in the step format she lays out for children, but I have not included all of her specific instructions for children. Preheat oven to 350 degrees. Put 12 muffin papers in the muffin pan. Sift 1 1/2 cups of flour, 1/2 teaspoon salt, 1 1/2 teaspoons baking powder (Mollie tells children to use a strainer and gently shake it over the bowl, which is a great solution if you don’t have a sifter). Add 3/4 cup sugar and stir with a wooden spoon. Make a dent in the middle and set aside. Measure 1/2 cup of milk. Break two eggs into a bowl. Add milk and 1 teaspoon vanilla extract. Melt 1 stick of butter and pour into milk mixture. Beat the batter for 2 minutes on low speed with an electric mixer. Beat the batter for 2 minutes on high speed. Put two spoonfuls of batter into each muffin cup. Push organic chocolate chips into the top of each raw cupcake (optional). Bake for 20 minutes. Let cool for 15 minutes before eating. These cupcakes are buttery rich and can be topped with organic powdered sugar, your favorite icing, organic chocolate chips (before baking), or nothing at all. This first cookbook has started my daughter on her adventures in cooking I hope will last a lifetime. Hmmm, I wonder what she will make for dinner? It’s great your daughter loves to cook. My 16 yo started cooking when she was about 8 – now she cooks as much as I do. Start them out young! Good for you for letting her give it a go, that’s great! My 4 year old loves Salad People right now and I am sure would love to graduate to Honest Pretzels and doing more by himself! We love Mollie Katzen around here. This book would be great for my son and I. He loves to cook with me and baking is his all time favorite. A young budding man is never too young to learn to cook. I always tell him…”Everybody has got to eat!” Love this book…just added it to my media library collection.